The foundation of the xPapers platform is an array of specialized crawlers and metadata extraction utilities which together can index virtually all online contents in a discipline, whether from journal publishers, personal pages, open access archives, Google Books, book retailers, or libraries. 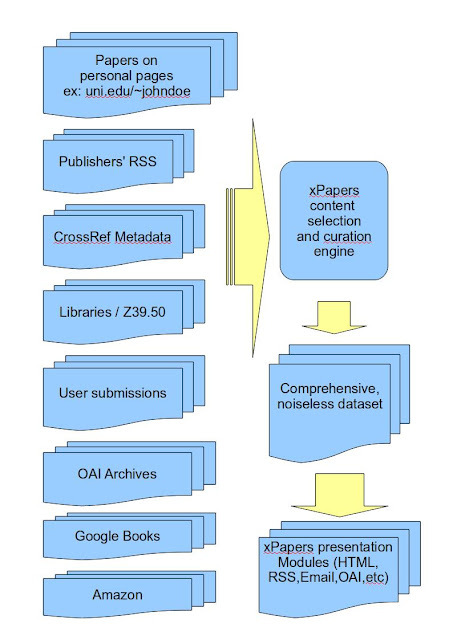 xPapers includes a repository where researchers can submit their works. Repository entries are displayed alongside other index entries, thereby rewarding submitters with visibility. xPapers search is powered by Sphinx. It features stemming and very powerful search operators (+, -, *, and a lot more) with great performance. xPapers also provides highly flexible content alerts through RSS and email. Users can add, edit and delete index entries. A journaling system ensures that all changes are reversible. At the choice of the administrator, some changes can require approval before taking effect. The contents of xPapers' index is organized in a flexible category system which is managed by the community. Administrators and users have at their disposal powerful tools for populating categories. In addition to the category system shared by all users of the site, individual researchers can maintain their own bibliographies. These bibliographies can be published alonside the canonical categories. Researchers can easily track new works in their areas and journals of interest, as well as monitor the literature based on flexible search criteria. Monitoring can be done on the web site, by email, or through RSS. Researchers can create public profiles to display their works. This is very easy with xPapers, because it already has most of a researcher's publications. Profiles are also used to manage alerts and other services. xPapers comes with a fully featured discussion forum system which is tightly integrated with its index. Any index entry or public category can be associated with a public discussion forum. xPapers' event announcement system allows users to view and monitor events in their discipline based on location and/or topic. Monitoring and parsing of metadata from papers on personal web pages is supported through opp-tools, a standalone component of the xPapers platform which is distributed independently.